Congratulations! You have made a very important decision in relation to your academic career - the decision to study abroad as an Erasmus student. We are delighted that you have chosen the National University of Ireland, Galway (NUI Galway) as your international study destination. 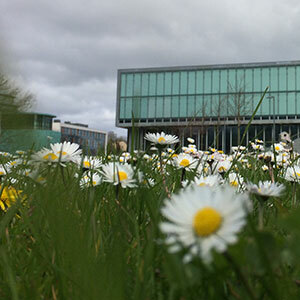 Today we have over 17,000 students studying at NUI Galway. Approximately 2,300 of these are enrolled as international students for a semester or a year, or are taking full degree programmes. 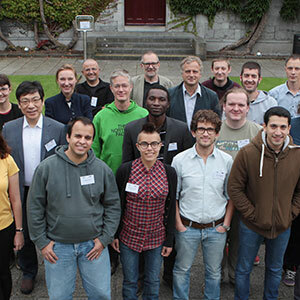 We have a long and valued tradition of learning and scholarship here in Galway and in recent years the University has committed itself to expanding and deepening its international links through staff and student exchanges and research collaboration. This University places a tremendous value on the cultural and academic contribution that you will make during your time with us. We are confident that in return you will find your stay here both intellectually stimulating and personally enriching. Cuireann Ollscoil na hÉireann, Gaillimh céad míle fáilte romhat! Ireland is an island situated to the Northwest of the continent of Europe, with a population of five million people. It is a sovereign independent state and a parliamentary democracy. The country gained its independence from Great Britain in 1922 and since then has enjoyed a stable government. Ireland is a full member of the European Union. The Irish Sea separates Ireland from Britain. The climate of Ireland is temperate; the winter temperature averages about five degrees Celsius and rises to an average of sixteen degrees Celsius in summer. Temperatures above twenty-five degrees Celsius are uncommon. One of the six Celtic nations with its own distinctive Irish culture and language, Ireland is long renowned for its strong tradition of development and educational links with other nations. Known in the past as 'The Island of Saints and Scholars', today Ireland has an excellent educational infrastructure and an exceptionally high rate of participation in third-level education. Irish (Gaelic) is the first official language although it is English that is most widely spoken. Some Irish words that you may see regularly are: Fáilte (Welcome), Gardaí (Police), Fir (Gentlemen), Mná (Women). Irish educators at home and abroad have contributed to the development of many societies and nations. In the fifth and sixth centuries, the organisation of early Christian Church in Ireland was based on monastic settlements. Some of these, such as Glendalough and Clonmacnoise, later became famous centres of learning, attracting many students from abroad. Later, Irish monks travelled all over Europe establishing monasteries and centres of learning. King Richard III granted Galway its first Charter in 1484, and the town has been a seat of learning since the 1560s, when its merchant families founded an academy for students from all over Ireland. Traces of Galway's rich medieval past can still be seen today in the maze of winding medieval lanes and old merchants' mansions in the city centre. Galway is now the third-largest city in the Republic, with a population of 76,000, almost 20% of which is made up of third-level students. 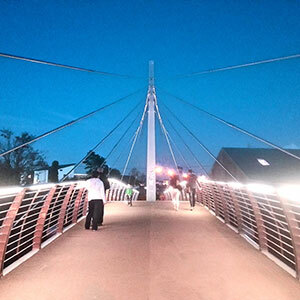 The interdependence of town and University has helped to build a compact, thriving city that caters to young people like few other places can. Its youthful energy is reflected in the numerous internationally-renowned literary, arts and sporting events that are hosted there each year, such as the Cúirt International Festival of Literature, the Galway Film Fleadh, the Galway Arts Festival, and the Galway Racing Festival. Regarded by many as the cultural capital of Ireland, Galway is home to the well-known Druid Theatre Company, the Macnas Street Theatre Company and An Taibhdhearc, the national Irish-language theatre company. Galway is located on the doorstep of Connemara, the largest Gaeltacht (Irish-speaking area) in Ireland and an area of wild and majestic beauty. With its unique landscape of lakes, bogs and mountains, it is among the most evocative part of the country. Anyone wishing to experience the Ireland of rugged countryside, castles, lakes and rivers will not be disappointed; other attractions not far from the city are the Burren and the Aran Islands. A particular feature of Galway and its environs is the fact that, in addition to the city’s strong cosmopolitan atmosphere, the older Gaelic culture of Ireland - in music, song and language - is especially strong and vibrant in the western capital. This means that a visiting student can conduct all his/her business effectively and easily in English, but can also, if he or she wishes, encounter the richness of Ireland’s Celtic culture in all its forms. 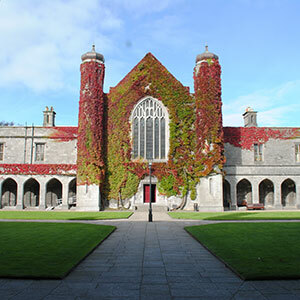 The University was founded in 1845 as Queen's College Galway. It was one of three Queen's Colleges founded under the Queen's Colleges (Ireland) Act, 1845, the others being located in Belfast and Cork. The foundations of Queen's College Galway were laid in 1846. The architect, Joseph B. Keane, who used local stone quarried during the Famine, was strongly influenced by the Gothic Revival in Architecture then in full swing. By 1847, despite the Famine, construction was well advanced and Queen's College Galway opened its gates on 30th October, 1949, to 68 students. Under the Irish Universities Act (1908), Queen's College Galway became a constituent College of the new National University of Ireland, and under a new charter the name of the College was changed to University College, Galway. 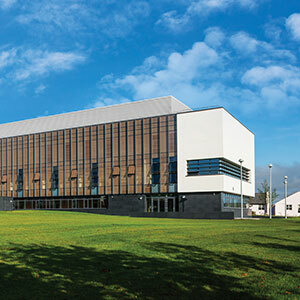 In 1929, the College was given a special statutory responsibility under the University College Galway Act in respect of the use of the Irish language as a working language in the College. Under the Irish Universities Act (1908), Queen's College Galway became a constituent college of the new National University of Ireland, and under a new charter its name was changed to University College, Galway. 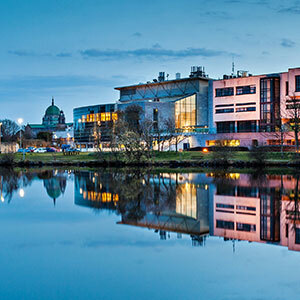 Then, in 1997, it was again renamed, this time as National University of Ireland, Galway. 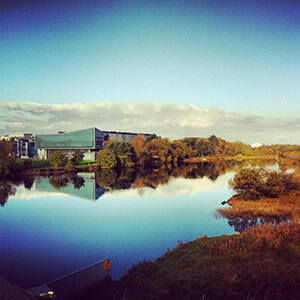 The campus itself is situated on the banks of the River Corrib, on one of the most attractive University sites in Europe. The original mid-nineteenth century university buildings are in the Tudor architectural style. The old stone quadrangle at the heart of the campus is flanked by new buildings, which reflect the steady growth of the University over the past decades.